In Episode 16 of the Khandaan Podcast, we continue with our new limited edition format: this time, a buy-one-get-one-MUFT! MUFT! MUFT! 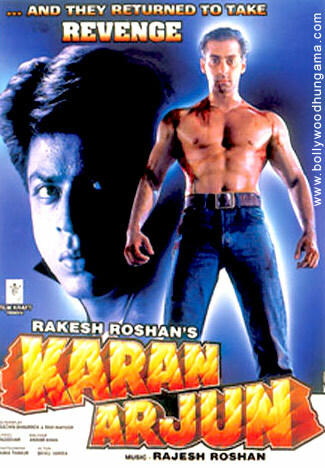 film called Karan Arjun (1995). Starring Shahrukh Khan and Salman Khan, this film has penetrated deep into desi pop culture – spawning satirical skits, comedic shorts, and memes galore with its extremely quotable quotes, outsize characters, and a type of masala filmmaking that is both antiquated and sorely missed today (by us, if no one else). This Rakesh Roshan film co-stars Kajol, Mamta Kulkarni, Amrish Puri, Rakhee Gulzar, Ashok Saraf, Johnny Lever, Ranjit, and other well-known and well-beloved actors. This week our Top Bro, Beth of BethLovesBollywood is back – revealing herself to be a first-time viewer in our shocking revelation of the week. We also discuss the brand-new release Dhadak and the many controversies it spawned, sparking some lively discussion. Here is an article and a video that caught our attention. We then look at some underwhelming new trailers for films we probably won’t watch. Note: The Khandaan podcast is an interactive experience! Please click below to vote for the next movie you think we should feature. For episode 17, we have Salman Khan’s early era.